Your Own Turn-Key Note Website in as Little as 72 Hours! No matter how you want to participate in the note industry: as a buyer, broker, or funder, you need a professional online presence that starts with a proven website. Until now, that could be cumbersome and costly. We have removed all the barriers and created turn-key websites for cash flow professionals. You choose a theme and we will do the rest. Whether your specialty will be to broker private mortgage notes or invest in notes, we a have turn-key website, WITH pre-loaded content, ready to go for you in as little as 72 hours! 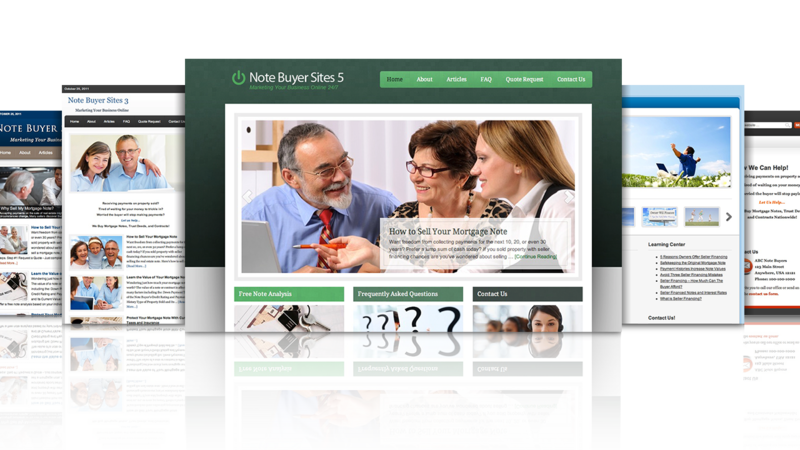 A couple years ago, we turned the note business on end by offering an affordable website for buying, selling, and brokering mortgage notes. Why did we start offering websites? Well as many of you know we have an online training, called Finding Cash Flow Notes, where we share our real world experience – including our best note finding secrets. Our commitment was (and still is) to make sure that participants have all the knowledge they need to succeed. In that training we also unveiled some of our favorite tips for running your cash flow business online – what we didn’t expect was the number of people that didn’t even have a website. Expanding your business online can be a headache. Where do I buy a domain name? Where do I host my site? What the heck is SEO, HTML, and WordPress? Blah, blah, blah. Frankly, the Internet is not something they taught us in school (well, at least not at our age). So getting up to speed can be more difficult than ever. But it doesn’t have to be that way AND it doesn’t change the fact that you need to be online! When the Internet really got rolling, we didn’t think sellers would actually look for information online when it came to selling their notes. At the time, most of our business was over the phone or face-to-face and we thought it would always be that way. Now the Internet is such a mainstay, people search for everything they need online! There are over 239 million people online in the U.S. alone! That is over 77% of the population. The question is not “SHOULD” your Note Business be on the Internet? The question is really “HOW” can you get a great looking site online with solid content at an affordable price? Pick a look and feel that best fits your personality. There are fourteen professional themes to choose from (including additional color and photo options). Every one of our sites are built on the rock-solid, web optimized, WordPress Genesis platform. We are going to give you a big jump-start by adding content to your site…immediately. Over 15 articles and pages you can call your own. Edit, re-write, or leave as-is…the choice is yours. Each and every site is SEO ready. The sites are Search Engine Optimized so you can get found online! There is also a blog function built in that allows you to easily add new articles and unique content for ongoing SEO. Each and every site comes with a special page that people can fill out online and submit you a potential deal. Your business is open 24/7! Want to sell a few ads or banners to others? You can do that! Want to link to your referral sources or other services? You can do that too. Want to install Google Adsense? Monetize your site while you are getting deals! We know some people are new to websites and we have training just for you. If you have never dealt with websites or WordPress, you will get immediate access to a special training program with easy to follow videos – all designed to help you. You can even ask questions IN the training! Course, you don’t need to do anything or even touch the training. Your site will be up and running from day one. We have seen people out there charging crazy amounts of money for websites that you don’t even own! In our case, YOU own the site. You control the site. 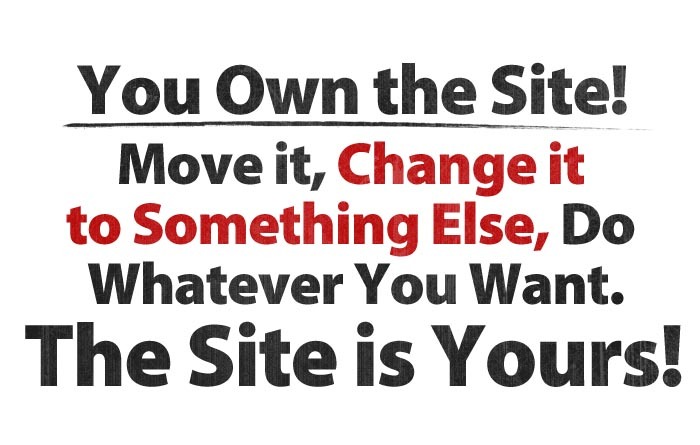 Move it, change it to something else someday, whatever you want – the site is yours. First off, despite what our competitors will tell you, you don’t need to spend $5,000 on a website. Matter of fact, you don’t need to spend $2,500 or even $1,000 on a quality site. We are offering websites for an incredible $447 – and you are not even going to pay that! Bonus #1 – Take $100 off! For a limited time, we are going to take $100 off the top (that is an immediate savings). Just for taking action now! Bonus #2 – Get a Custom Header! Want your logo at the top of your site? Just send it over to us and we will add it to your site at no additional cost! Bonus #3 – 12 Months of Free Hosting. We cut a special deal with the same company that hosts our own websites. Not only are you going to get the first twelve months free, you can have future hosting as low as $9.95 per month! No hidden fees! Your very own website built on the rock-solid Genesis WordPress platform. Pre-loaded, ready-to-use, content about the note industry. A Google friendly SEO site (optimized for search engines). A note submission form BUILT IN – 24/7 Access! FULL access to the online WordPress training class! ...and 12 Months Free Hosting! First we turned the industry upside down by crushing it with our Finding Cash Flow Notes Training Course. Now we aim to over-deliver again and provide the same level of high quality service you have come to expect from us (and maybe piss off a few competitors) by offering an amazing, affordable, way for people to finally get their note business online. Establish a Presence – With over 239 million people online in the U.S., how can you NOT be there? More Advertising for Less Money – Your site works 24/7 – Try hiring someone to work that much! Answer Questions Immediately – Having items like the FAQ page gives potential clients answers when they want it…NOW! Get Referrals – With a website, professional referrals have a place to send you business! Establish a Relationship – People want to do business with people they “know.” What better way to present who you are? Gather Contact Information – Maybe they are not ready to sell now. You can set up your site to gather contact info and send them an occasional eletter – be there when they are ready to sell! Check out our Website FAQ Page Here. SSL Certificate included ($97 value).